Click to download or view the 2019 Exhibitor Contract. 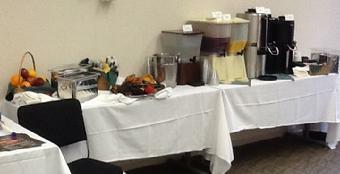 Continuous Refreshments in the Exhibits Area During the Day & at the Wednesday Night Social Hour. Raffle Prizes are also Given Away During the Breaks and Social Hour. Western States Corrosion Seminar is actively seeking exhibitors and sponsors for the May seminar. Companies interested in exhibiting their products or services have an excellent opportunity to meet their future customers. Open on Tuesday and Wednesday, the exhibit hall is the main gathering place during morning and afternoon breaks. That's where we put the refreshments!! We also give away door prizes at each break. Tuesday evening when the last class ends the exhibitors and sponsors will host our social hour, where complimentary beer, wine, mixed drinks, soft drinks, and assorted snacks are served from 4:30 pm to 6:00 pm. Wednesday evening's social hour will be held in the exhibit hall. Complimentary beer, wine, and snacks are served from 4:30 pm to 6:00 pm. Please help this seminar become another success. We need your support. All exhibitors' and sponsors' company names will be prominently displayed at all functions clearly indicating your participation and support of this non-profit educational program. A link to your web site will be included on this page for the year. For an additional $25 as a sponsor ($100 total), your business card or logo will be added to the SPONSORS' LINK web page. The fee is $400 per space which includes two (2) 24" wide x 60" long tables with a total display area of 48" x 60", registration for one company representative, lunch, and continuous refreshments. 110 V power is available only along the outer walls. Bring your own extension cords. An additional $200 for both days is charged for each additional company representative and includes registration, lunch, and snacks. Mail early! All spaces are reserved on a first-come, first served basis. Exhibitors may set up Tuesday from 6 am to 10 am. Exhibits are open from 10 am to 4:30 pm on Tuesday and from 9 am to 6 pm on Wednesday. Tear down may begin Wednesday evening after the Social Hour (around 6 pm) and must be completed no later than 8 pm. If your company cannot exhibit this year, please consider sponsoring our "Social Hour." A $75 donation will list your company's name on a large sign displayed in the exhibit hall and during the social hours. A link to your web site will be included on this page for the year. For an additional $25, we will include your business card on our rotating list of cards on our home page as well as on our SPONSOR page with a link to your web site. Lodging at Kellogg West is $95 per night (single occupancy) and $105 (double occupancy) plus hotel occupancy tax and includes breakfast. Call Kellogg West directly at (909) 869-2222 and request a reservation using the "Western States Corrosion Seminar" or "Leader #136904" rate by April 16 to ensure the group rate is honored. Breakfast and dinner in the Kellogg West dining room can also be purchased separately if you are not staying on-site. Breakfast and dinner tickets can be purchased at the Registration Desk. Registration and payment are only available ONLINE using PayPal, a secure online payment service provider. We accept VISA, MasterCard, American Express, Discover, PayPal Balance, and Bank Tranfers.